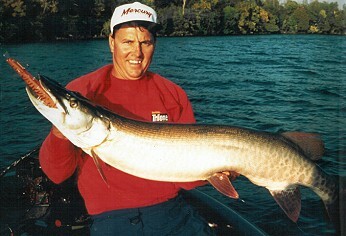 Bobbie Baits have been pulling in record Muskies for more than 50 years. The Bobbie Bait is a quality lure, constructed from hand-turned pine, mounted with a pressed stainless steel adjustable tail and three treble hooks. You can take advantage of Bobbie Baits extraordinary fish-catching capabilities by putting into practice a few of the following tips for getting better results with your new Bobbie Bait. The action of your Bobbie Bait is dependent on the amount of play you use and the angle of the tail. By bending the tail down, the bait will run deeper. Bend the tail up, and the bait will pop to the surface. In eithier case, personal experience has proven that best results are obtained by casting your Bobbie Bait with a moderately stiff rod, 50 to 60 feet. Then simply jerk the rod tip five to six inches, repeating this motion while retrieving the bait. The weighted Bobbie is not neutrally buoyant instead,it has just enough lead to prolong its "hang time", making it an excellent choice for cold-weather fishing, deep water fishing, or other conditions that dictate using a deeper, more deliberate approach. Trolling with the Bobbie Bait is a sure fire Muskie getter. The bait should be worked in a fashion similar to that described for casting. Trolling will attract not only Muskies, but any large game fish. Compare the Bobbie Bait to any of the hundreds of other baits you'll find on the market today. You will see a distinct difference. The fish see a difference, too, as more and more Muskies are being caught on the Bobbie Bait every year! The Bobbie Bait comes in many fish catching colors, and many sizes sizes. Whether you fish in lakes or rivers, clear water or stained, hot or cold weather... there's a Bobbie Bait to meet all your fish catching needs.